Veganism is one of the largest growing lifestyles with 3.5 million people in the UK having now made the change to eat plant based. In London we are spoilt for choice with vegan and vegetarian restaurants popping up on every corner as there is more demand than ever before. 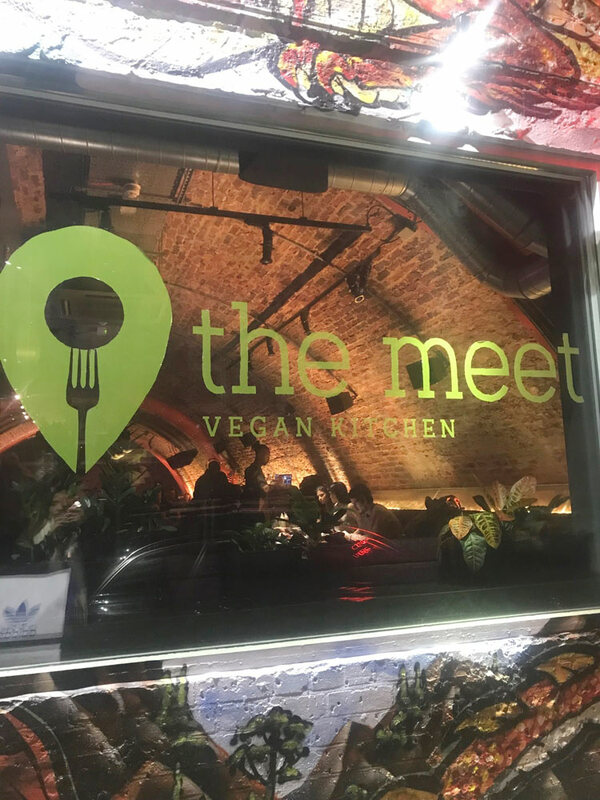 ‘The Meet’, launched in November 2018, is a brand new pop-up a stone’s throw from Clapham North tube station. This has been set up by Dominic Taylor, who is formally known for being executive chef at The Jam Tree. The idea behind The Meet was to offer indulgent plant-based comfort food with the same taste and texture of meat to create similar friendly alternatives. I’m not a vegan or vegetarian convert yet but always liked the idea and really enjoy cooking and experimenting with vegan recipes. I also understand the reasons behind it, not only on the planet but also on our health. I was vegetarian for a month last January and found it quite tough, I definitely missed fish the most as I’m still yet to find a close substitute. My diet currently consists of 80% vegetarian food with the rest consisting of fish or chicken. At the Meet, eating all the food! 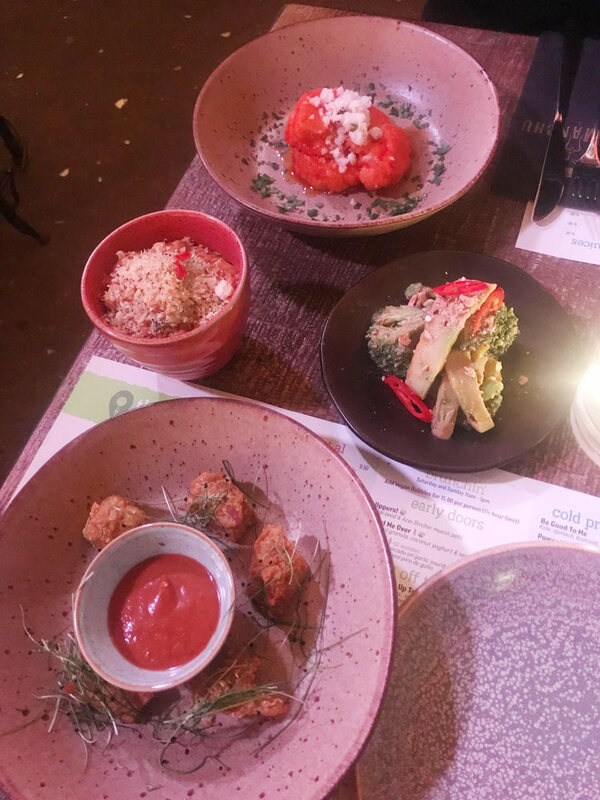 My friend and I were invited down to ‘The Meet’ in December to feast on a fantastic plant-based spread – four sharing starters, one main each and a few cocktails. For starters we had ‘Green Giant’ – satay dressed charred broccoli, edamame, tofu and avocado, ‘Give Me Wings’ – bourbon, maple and siracha glazed cauliflower florets topped with ‘blue cheese’, ‘A Nugget Of Gold’ – southern fried seitan nuggets with sweet curry sauce and ‘Mac Daddy O’ – you’ve already guessed it, vegan style mac & ‘cheese’ with an option to add some ‘chorizo’. We enjoyed all the starters, each one indulgent and wholesome with plenty of flavour. 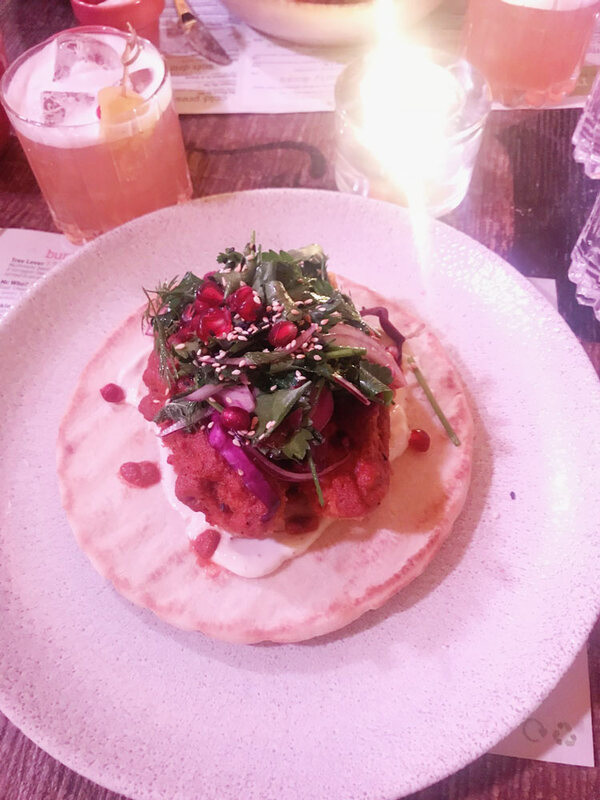 For the main I chose the ‘I Don’t Give A Lamb!’ – an open kebab with 3 bean and organic tofu kofte’s on artisan flat bread with sauces and garnish, served with chips. My friend had ‘What A Mess’ – smokey black bean, plantain and jackfruit chilli served messy with fried and ‘cheese’. Both incredibly pleasing and filling, the portion sizes were very generous so I wouldn’t recommend going too crazy with the starters if you’re planning to have a main each. This restaurant really does cater for everyone, whether you’re a huge advocate of meat, a committed vegan or an experimental foodie they have food designed to suit a spectrum of taste buds. At the weekends they offer a bottomless brunch as well as Sunday roasts. For the healthy early riser types there is a selection of cold press juices, quinoa porridge and avo on toast. The setting is relaxed and comfortable and works as a perfect spot for a date night drink or after work for a relaxed bite to eat. 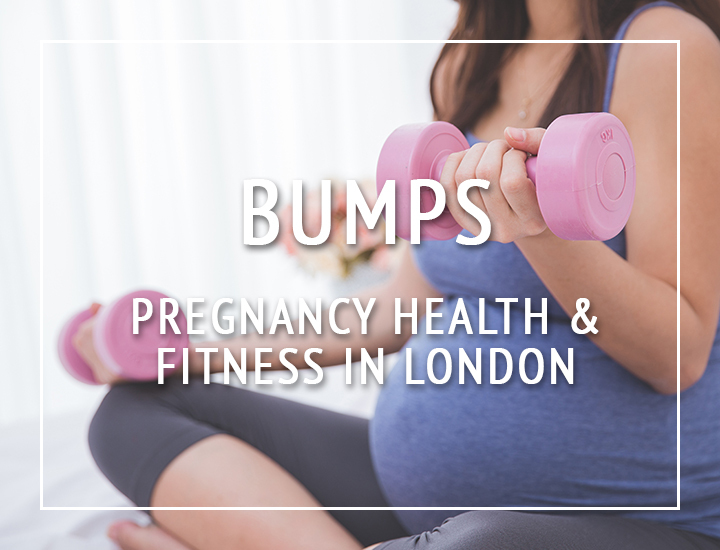 For bookings, call 0203 397 7475 or visit their website www.the-meet.co.uk/bookings Whilst you’re at it, take a look at the menu!